A well-trained cosmetic dentist understands that the first step in designing a whole new smile for you is listening. The dentist needs to take some time to understand you, how you feel about your smile, the personality you want to project, and how much you want to spend. The cosmetic dentist will also take into account your facial shape, hair color, and complexion. He or she will then create a smile design for you based on all this information. Some cosmetic dentists will create a digital smile makeover by computer, simulating how you will look with your new smile. Others will create the new smile in wax, based on your desires, and from that wax model will make a set of provisional veneers for you to wear and test drive. Only after you are happy with the appearance of these provisional veneers will they finalize the shape and color of your porcelain veneers. Also before any successful smile makeover, your teeth and gums need to be in good health. In particular, if your gums are inflamed, that problem may need to be addressed first. If your gums tend to bleed, for example, it will be difficult to get an exact impression of your prepared teeth and difficult to isolate the teeth for proper bonding procedures. If you have advanced gum disease, you could be at risk of losing your teeth, and an ethical dentist will want to make sure that problem is taken care of before asking you to spend thousands of dollars on a smile makeover. So if your gums aren’t healthy, the first step will be to get them that way. This could be something as simple as a regular dental cleaning, maybe with follow-through to make sure your home care is adequate. In some cases, more extensive gum treatments may be necessary. The most widely used technique for placing porcelain veneers involves some tooth preparation. Your teeth are prepared by removing a small amount of the front surface of the tooth (about 0.3 to 0.5 millimeter—the thickness of a fingernail) to allow space for the porcelain. Then the dentist takes an impression of your teeth. This impression is used by the laboratory technician to create your veneers. After your teeth are prepared and before the veneers are placed, the teeth will feel rough and somewhat strange. Usually the dentist will place temporary veneers on your teeth, but this isn’t always necessary. In most cases, the appearance of the prepared teeth is nearly normal, especially at conversational distance. If you don’t have temporary veneers, simply keep your teeth well-brushed, because they may tend to stain more easily at this time. They will also be extra sensitive to air and cold. A coating placed on the teeth can minimize this sensitivity. Some cosmetic dentists will sometimes use what is called a no-preparation technique. Sometimes this is because the patient is apprehensive. Sometimes it may be that the nature of your case makes it so that tooth preparation isn’t required. But be careful. Successfully using a no-preparation technique requires more skill on the part of the dentist and the laboratory, not less. And veneers placed with a no-preparation technique will have a slight ridge where the veneer meets the tooth, rather than a flush and perfectly smooth transition. Veneers are thin wafers of porcelain. It is critical to keep the gums healthy at this time. If they are puffy, they will tend to bleed easily during the bonding of the veneers, which will contaminate the bond, making it impossible to bond them correctly. Floss thoroughly, every night. If you notice any bleeding in the gums, floss more frequently. Porcelain veneers, to be done right, need to be made at a dental laboratory that dedicates itself to producing high-quality cosmetic work. Ordinary dental labs simply don’t have the expertise and talent to produce these works of art. Photographs and models may be sent to help them achieve an artistic result that will be customized to your personality and that maximizes your facial attractiveness. One difference we have noticed between serious cosmetic dentists and dentists who just dabble in cosmetic dentistry is the importance they attach to the try-in of your new smile. Serious cosmetic dentists will stock try-in pastes and will make sure you get an excellent opportunity to see how the porcelain veneers look in your mouth before permanently bonding. The fit of the porcelain is also checked at this time. If you have any reservations about how they look, the serious cosmetic dentist will have the veneers sent back to the laboratory and re-made, if necessary, to meet your expectations. Another try-in will be scheduled until your smile looks just right. Bonding involves an elaborate series of steps that bond the veneer to the tooth. These bonding procedures are not fully taught in dental schools. Additionally, bonding technology keeps changing with newer materials and techniques. This is another of the reasons that a dentist, to do this well, needs to be dedicated to extensive education beyond dental school. The end result is a durable, beautiful restoration that will last for years, even decades, and acts like it is a part of your tooth. How long the veneers last depends a lot on how well you and your dental office take care of them. Please see our page on care of porcelain veneers for more information on maintenance. Porcelain veneers are not designed to withstand sharp impacts and can fracture, just as your natural teeth can fracture. Do not bite pins, nails, bottles, etc., and do not strike them with hard objects. If you engage in contact sports, wear a mouth protector. Do you have other questions about porcelain veneers or are you looking for an expert cosmetic dentist? We maintain a list of cosmetic dentists who are screened for proper training in cosmetic dentistry. Dr. Hall will also answer questions if you e-mail him. Check our “find a cosmetic dentist” page for a list of cosmetic dentists screened for training and artistic talent in creating smile makeovers. The vast majority of dentists are not artistically inclined. I would strongly recommend against asking your family dentist to place porcelain veneers, even though he or she may assure you that they know how to do this. If you have questions about whitening toothpaste, we have answers. 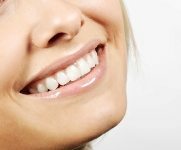 Click here to see porcelain veneer pictures featuring the beautiful work by some of the expert cosmetic dentists we recommend on mynewsmile.com. Check our main porcelain veneers page for more information about porcelain veneers and what they can do for you. See our mynewsmile.com blog where Dr. Hall answers a question about porcelain veneer maintenance.